This past February, Brand Keys announced the list of the top brands that 42,792 U.S. consumers found to be most emotionally engaging and, therefore, the ones they were most loyal to. That meant consumers saw those brands best meeting their ever-expanding, mostly-emotional expectations in the categories in which they competed and the one’s they chose over competitive offerings. Alas, as is the nature of lists, there’s a top and a bottom. 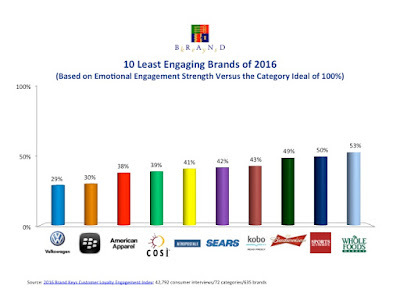 So now the list of the least-engaging brands of 2016. The fundamental reason the brands ended up there is they were just unable to meet the very high (and ever-growing) emotional expectations consumers bring with them to the marketplace. Those are values consumers use to “measure” brands and is, thus, a predictive measure of how consumers will view the brands and how they’ll compare brands. Most importantly, it tells you how they’ll behave toward the brand and what will then show up (or won’t show up) in the marketplace and, ultimately, on brand profit-loss statements. 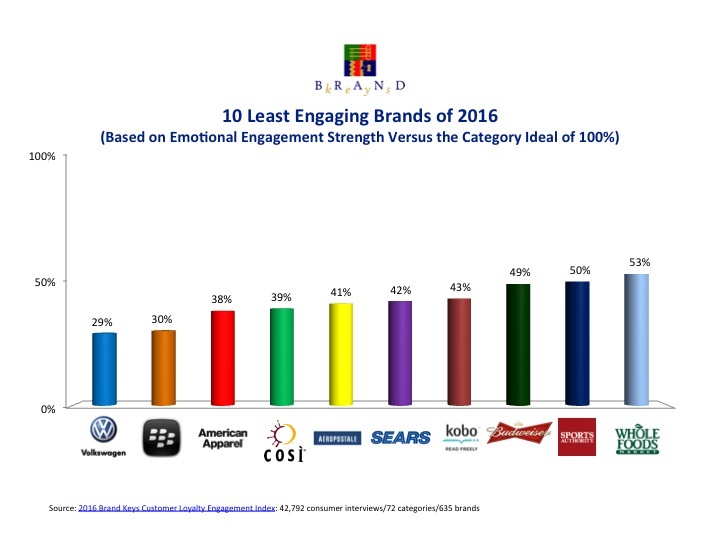 This year’s 10 least-engaging brands included the following (presented in reverse order) beginning with the brand with the lowest emotional engagement strength, versus their category’s Ideal, calculated to be 100%. Asterisks (**) indicate brands that are new to the least-engaging list. Independent validations have proven that brands that better meet consumer expectations always end up on the top of the list. They always see better consumer behavior and, axiomatically, that always results in greater sales and profits (see “2016 Customer Loyalty Engagement Index” results here). But the reverse is equally true. Think about how you’d feel if you shopped for some brand and it only delivered 39% of what you actually expected! What would that voice in your head say then? Whatever it’s saying, we’re pretty sure it’s not whispering! Oh, and when it comes to just trying to stay in business, selling off real estate has nothing to do with emotional engagement and pretty much everything to do with short-term survival strategies! Brands that do that usually end up at the bottom of the list or are already at the bottom. But sometimes – if you know which emotional values to use – rock bottom can be the perfect place to rebuild your brand.